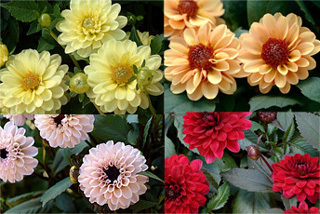 A collection of�9 dahlias that are true "Border" types that stay 12" or less all season. Developed by New Zealand plant breeder Dr. Keith Hammett and Corralitos Gardens, these are a breakthrough in combining low plant growth with ultra high quality blooms. Separately they are priced $6.00. For the entire collection of�9 you will save $9.00.